A suicide bomber blew himself up inside a mosque in southern Afghanistan on Thursday, killing Helmand province's deputy governor and five other people, officials said. The bomber struck in the provincial capital of Lashkar Gah, said provincial police chief Mohammad Hussein Andiwal. Helmand's deputy governor, Pir Mohammad, was killed in the blast, said Nisar Ahmad, a provincial health official. The blast killed five other people and wounded 11, Ahmad said. Earlier Thursday, a suicide bomber exploded a car next to an Afghan army bus in Kabul, killing one person and wounding four others, while authorities in the east said they found the decapitated bodies of four road construction workers. The blast shattered the bus windows and badly damaged a passing taxi in Kabul's Taimani neighborhood, said police officer Jan Agha. A civilian was killed and four other people including a soldier were wounded in the explosion, the Ministry of Interior said in a statement. Militants regularly attack Afghan and foreign troops with roadside and suicide bombs, but most of the victims are civilian. A series of attacks last year targeted buses carrying Afghan security forces, a key element of U.S. efforts to beat back the insurgency gripping the country's south and east. 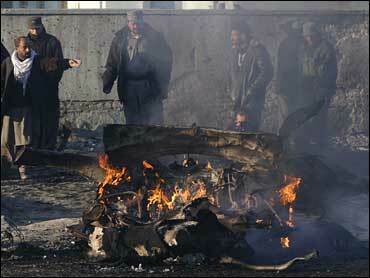 In September a suicide bomber blew himself up in an army bus in Kabul, killing 28 soldiers and two civilians. In June a bomb ripped through a bus carrying police instructors in Kabul, killing 35 people. Thursday's violence comes two days after a new independent study was made public, warning that Afghanistan risks sliding into a failed state and becoming the "forgotten war" because of deteriorating international support and a growing violent insurgency. Last year was Afghanistan's most deadly since the ouster of the Taliban in a U.S.-led invasion in 2001. More than 6,500 people - mostly insurgents - died as a result of violence, according to an Associated Press count of figures provided by local and international officials. Meanwhile, in eastern Nuristan province militants beheaded four road construction workers and dumped their bodies on the side of the road Wednesday, said deputy provincial police chief Mohammad Daoud Nadim. The demonstrators from the small, secular Solidarity Party rallied in front of the United Nations office in support of 23-year old Sayed Parwez Kaambakhsh (at left), who was sentenced by a three-judge panel in the northern city of Mazar-i-Sharif for distributing to journalism students a report he had printed off the Internet. The article asked why Islam permitted men to have four wives but women could not have multiple husbands. Kaambakhsh has appealed his conviction. International human rights groups have condemned the sentence but Afghanistan's upper house of parliament welcomed the ruling and criticized "international interference" in the matter.